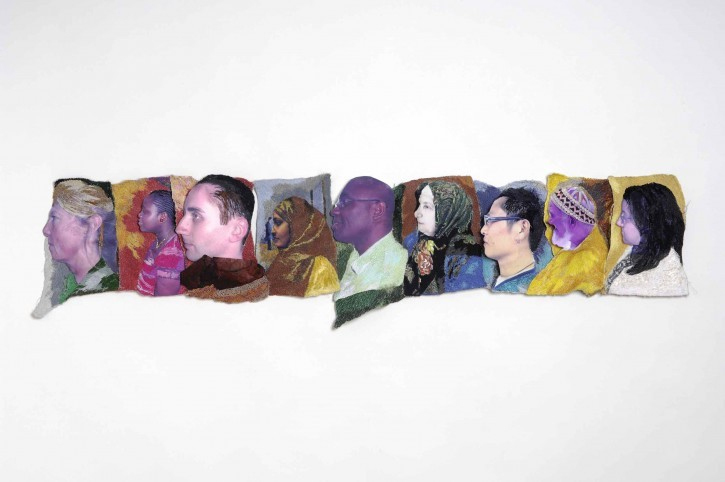 This entry was posted in Exhibitions, Experiment Station and tagged 61st panel, immigration, Jacob Lawrence, migration experience, migration stories, Panel 61, The Migration Series. Bookmark the permalink. Does anyone know if these paintings by Brian Whelan are going to be exhibited at The Phillips? These works are quite startling visually but in addition to their having a joyful playfulness, there is clearly much more to them beneath the surface. I had seen Whelan’s very large Holy City painting which National Cathedral exhibited as part of their 9/11 commemoration. That work also has gold foil embedded within the paint and had a remarkable effect in the light of the cathedral’s vestibule so these paintings really need to be actually experienced and not just seen in a digital reproduction. These paintings seem to have the ability to address serious subjects while keeping viewers entranced by their virtuosity. The Whelan paintings shown here in the Phillips Experiment Station also have deeper associations than the text quotes reveal. The “Myth of Return” painting clearly also alludes to the voyage of Saint Brendan who in the 5th century set out across the Atlantic from Ireland with a boatful of monks in search of paradise and perhaps even found America. This is certainly a perfect image in counterpoint to the Jacob Lawrence series and speaks to the many contentious issues of immigration today. 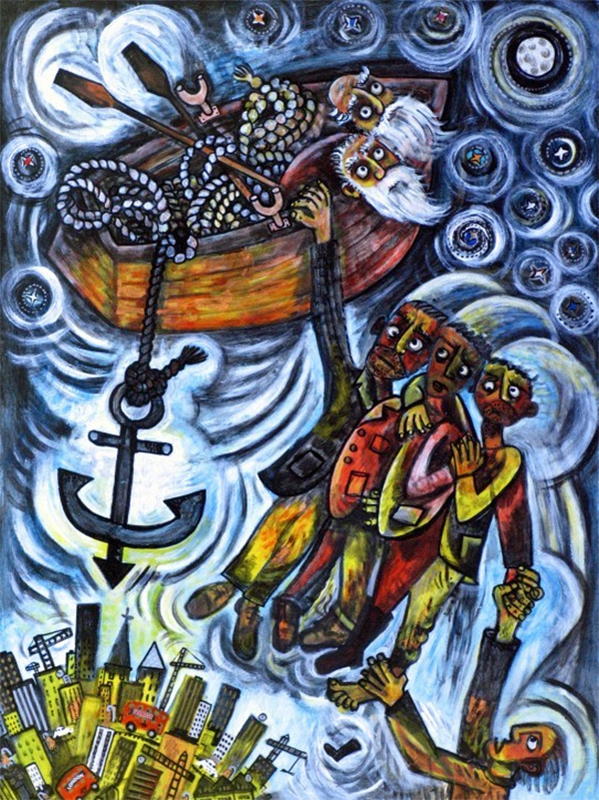 The second painting with the perplexed figures dangling below a ship with anchor seemingly sailing the sky connects to medieval Irish stories of aerial ships whose crews have escaped the turmoil of life here on earth. One such account appears in Seamus Heaney’s poem Lightning viii, which begins “The annals say: when the monks of Clonmacnoise Were all at prayers inside the oratory A ship appeared above them in the air. The anchor dragged along behind so deep It hooked itself into the altar rails”. I have found further works by Whelan at the website: http://www.brianwhelan.co.uk. I would strongly urge the Phillips to exhibit some of these paintings by Brian Whelan.